A simple lesson from Apple and Groupon: Are you asking could, when you really should be asking should? In a recent interview with Charlie Rose, Apple CEO Tim Cook said the hardest decisions Apple makes "are all the things not to work on." (Clip | Full interview) Perhaps you've read this before, but it represents a significant insight into how Apple continues to create products that people love. Apple chooses to focus on what they should make instead of what they could make. Could we make a crowdfunding platform? Could we get everybody to do something at the same time? Could we create a market for crowdfunding? Could we build a dome over Chicago? What happened? They proved to themselves that they could do some of those things, but also that their experiment wasn't going to live up to their expectations. They were asking the wrong question. In a last ditch effort, Mason was forced to think about what to do with the remainder of their funding (and potentially his time). It could have meant more User Experience and Design enhancements to ThePoint.com, but instead he decided to ask our collective team what they should be doing with what they had learned, what they knew and where they were finding success. In just 4 weeks, a WordPress site called Groupon.com was born. We officially live in the, "there's an app for that" culture. There are over 1,000,000 apps in the iTunes store because it's full of "Could there be...?" apps. The "should there be" apps are the ones that actually make it to your phone. Call it whatever you want: 'The Why', failing fast, iterating, agile, 'the killer question' or determining your MVP. It isn't until we start asking the tougher questions around what we should create, do the best products and businesses get created, shared and ultimately used by the masses. Creating Eight Bit Studios has put us at the bleeding edge of every serious website and mobile app conversation in Chicago. Often, we find ourselves helping people confront and answer this question of “Could vs Should”. For as thrilling and exhausting as it is to live and work on the future, we make a point of not partnering with anyone who isn't sure why they should build what they want to build. That may come across as a little pretentious, but we have learned that companies that are willing to ask the right questions are ultimately the ones that are the most successful. Companies like Apple and Groupon show us that when you recognize that you could design and build anything, you gain the insight and capability to ask the really tough questions of what you should build. Learn from the best and stop trying to prove something through your coulds. Chicago's talent can execute any could in the world. Instead, be relentless with the question of what you should do and lead your product development through your insights. Do you think that's air you're breathing? Let's build the next great should, Chicago. 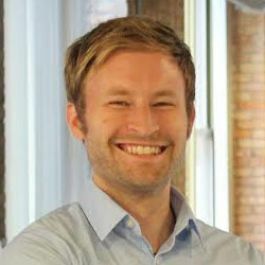 John W Ostler (@seahostler) is Co-Founder and Principal of UX & UI at Eight Bit Studios (@eightbitstudios) a mobile and website design and development studio in Chicago. He has helped lead and produce technical and interaction design engagements with brands such as Cadbury Adams, Burger King, Motorola, Career Builder, Groupon, Exelon, Sidley Austin, and HSBC. His work has been featured in the USA Today, Brandweek, The Daily Beast, NewYork Times Tech blog, Mashable.com, homepage of Drupal.org, and featured on multiple CSS design blogs. He is also Co-Host and Executive Producer of Bytes Over Bagels, Chicago's tech's favorite morning show.